Discover interesting facts and information about Stone Tools used during the Stone Age. Description and Definition of Stone Tools: Stone Tools were made of a variety of different stones, the preferred materials were primarily Flint and chert. The process of making stone tools from flint was called Flint Knapping and the stone tool makers were called Flint Knappers. Stone tools were used to make weapons for fighting, hunting, fishing, scraping and cleaning animal hides, drilling, engraving, carving wood. 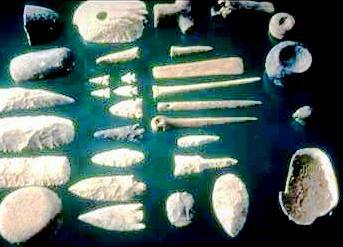 Stone tools were also used to make clothing, transport such as boats, shelter and decorative art. Stone receptacles were also made to hold household items. Many Stone Tools were made from a combination of items and materials. An Arrow or Spear had a stone or bone Arrowhead or point which was attached to a wooden handle and arrows would also have feathers attached, all of which were held together with a cord usually made from animal sinew or with various types of glue. Awls were bone or stone tools that were tapered to a point and used to punch holes in leather and wood. This hand tool was also used for shredding plant fibers for thread and fishing nets. Burins Burin were stone tools flaked into points for inscribing or grooving bone, stone, wood, leather or antler. These tools could have been used with or without a wooden handle. Biface and Uniface tools Biface tools were stone tools that had been worked on both sides or faces, meaning that flakes have been intentionally chipped off from both sides of the stone. 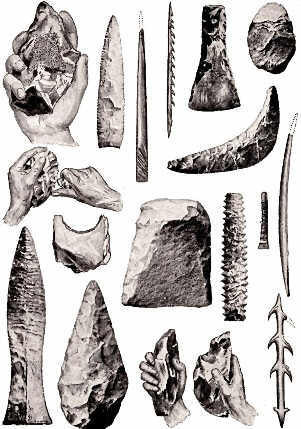 Uniface tools were those that had been worked on or knapped on only one side. Bulbar depression A depression left on the core stone when a blade or flake was struck off. Chert Chert is a A dense, very hard rock similar to flint and one of the preferred materials for making stone tools. It can be knapped but is mostly of lower quality. Chert is usually found in shades of white, pink, brown and grey. Conchoidal Fracture A type of break or crack in flint or quartz that results in a smooth rounded surface resembling the shape of a scallop shell or appears bent. Core A piece of flint from which flakes are removed. Blade cores were the stones used for manufacturing different kinds of tools by flaking off pieces from the core to make other stone tools and weapons such as knives, scrapers, spear pints, drills etc. Flakes & Flaking Flake - A flake is a piece of stone removed from a core. Flint Flint is a hard kind of stone, a large impure variety of quartz, usually found in gray, brown, reddish, green or nearly black colors and often has a glassy or waxy appearance. Used by to manufacture stone tools, such as spear and dart points, knives, and tools. Harpoons & Atlatls An Antler Harpoon was developed by Artic and Sub-Artic tribes for hunting large marine animals such as whales. 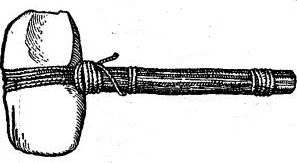 Antler harpoons were used in tandem with wooden launchers known as atlatls to help the harpoon penetrate prey with more force. Knives Knives were tools which were flaked to form one or more cutting edges. Needles Stone Age sewing needles made of bone with punched eyeholes. Used together with thread made from plant fibers or animal sinew. Obsidian A glassy, volcanic rock, often black in color, was used in ancient times to produce extremely sharp blades. Percussion The word percussion used in connection with making of stone tools relates to striking one solid object with, or against, another with some degree of force. Direct Percussion - Striking a core directly with a hammer or billet in order to drive off a flake - A glancing blow to the edge of the stone was usually made to avoid completely shattering the core. Indirect percussion - Interposing a bone or antler punch between the hammer and the core to remove any unwanted knobs or high spots. Allows greater control than direct percussion flaking. Scrapers Scrapers were tools made from a flake of flint that has small flakes removed from one side to create a working edge. Suitable for scraping and cleaning animal hides. The Stone Age life style of Native Americans ranged from nomadic, semi-nomadic to static across the vast continent of North America and despite this many of them shared similar culture and Stone Tools. 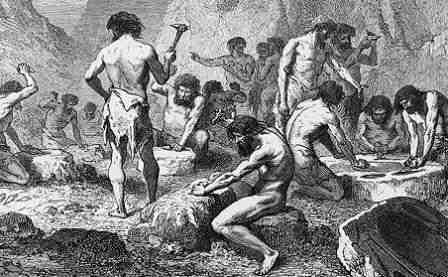 The basic component of the majority of their their tools were stone. Discover the interesting facts and information which relate to the History of Native Americans and the tools and weapons they used. The pictures on this site show the tools and tools that were used by various Native Indian tribes that can be used as a really useful educational history resource for kids and children of all ages. We have included pictures and videos to accompany the main topic of this section. The videos enable fast access to the images, paintings and pictures together with information and many historical facts. All of the articles and pages can be accessed via the Native Indian Tribes Index - a great educational resource for kids providing an unusual insight into their culture. We hope you enjoy watching the videos - just click and play - a great resource for gaining facts and information about the life of Native American Indians.